Have you ever applied to a position that you thought was a perfect match for your skills and interests only to be disappointed by receiving a rejection letter based on your written submission? When this happens it's important to first of all revisit the job description. In most cases, required qualifications are just that: required. If you don't meet them, you will likely be passed over at this initial stage. For further reading I suggest Alicia's post, which divulges even more industry secrets for job seekers. If you still can't figure out why you didn't get an interview, check over your submission for errors. We have already compiled a list of application tips, but let's delve further into the importance of proofreading your work. 1) You didn't care enough about the position to actually spend time composing an excellent application. RED FLAG! Please consult Eliana's post to find out why Passion Matters. 2) You are not meticulous or resourceful. BAD SIGN! Small details are important, and if you know they're not your strength, find someone in your trusted network to double-check your work. Once you think it's perfect and ready to send, I strongly suggest waiting a few hours and then reading the entire thing out loud. You'll be surprised at the edits you discover! If you're inspired by an exciting job opening, make the effort to represent yourself in the best possible light. More often than not, advancement to the next stage depends solely upon your written materials. 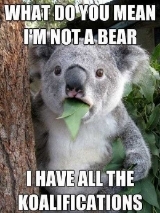 You may be perfectly koalified and boast ample relevant experience, however by submitting a flawed application you jeopardize your chances of landing an interview. Bear in mind that hiring managers have to consider a wide variety of factors when choosing applicants to interview, but by making sure your materials are top-notch you tip the scales in your favor! Check out Venus' post for more in-depth recommendations around effectively crafting your application.